Many people walking through the woods to Bachelor's Grove Cemetery have reported seeing a house out in the woods. They never agree on where the house IS in relation to the cemetery, exactly, but they all describe it the same way: a white, two story Victorian farmhouse, with a soft light glowing from the inside. Some say it gets smaller, or further away, as you walk closer to it. Some others say that if you go inside, you never come back out. When you come back out from the cemetery, the house will have disappeared. And there is no record of any house ever having been nearby. There are a few things wrong with this - one is that there are certainly records of there having been houses around there, and a couple of foundations of them are still out in the woods. However, the foundations don't seem big enough to be the house that people are describing. 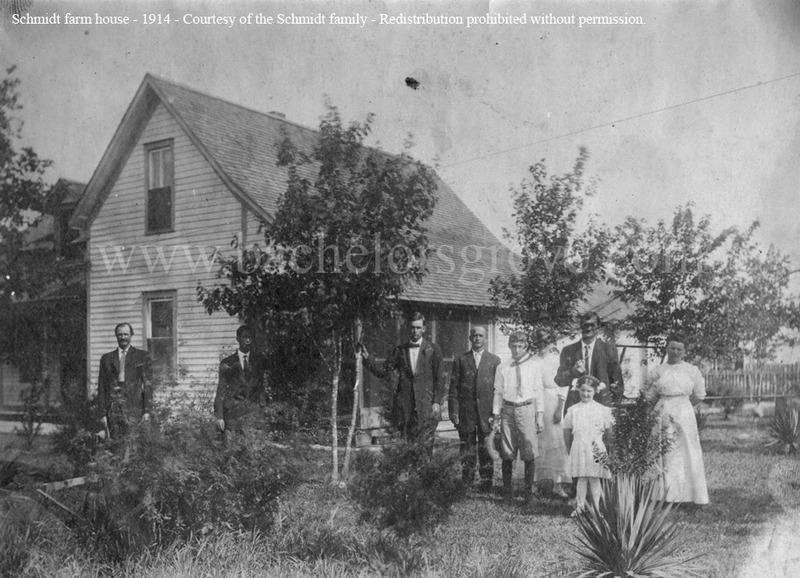 And there was a house there within living memory - the Schmidt house, pictured here in 1914, in a photo collected by Pete Crapia of bachelorsgrove.net . It was located a short walk west of the cemetery. The house above was built around the 1890s, and had clearly been expanded on occasionally. I'd guess that the portion visible to the left and the main house seen in the background here were built at separate times. Another interesting thing is that the house seems to have changed over the years. When Richard Crowe was first talking about the house in the 1970s, he told the Tribune that all of the witnesses he'd interviewed described it as a one story house. All of the witnesses I've spoken to - and all of the ghost books published in the last fifteen or twenty years - say it was a two story house. Now, on the surface, this might seem to discredit the story. But if the house can appear, disappear, move around the woods, and shrink, then it's not so unreasonable to think that it could also build an addition. And, furthermore, if the house is the "ghost" of the Schmidt house, one can see from the picture how a witness could describe it as either one or two stories, depending on what angle they saw it from. Now, given that the Schmidt house changed shape over the years, and likely continued to change beyond the 1914 picture, it's hard to tell what it looked like by the 1940s (when it was still known to be standing). No one is entirely sure yet when it was finally demolished, but it may have been standing as late as the 1960s. I've spoken with witnesses who swear that they used to have picnics outside of the house in the 1960s - they may have meant the It was certainly gone by the early 1970s, though. It could be that the whole legend arose from teenagers breaking in to get trashed in the 1970s (which was very common) and vaguely remembered there having been a house there years before, and, having had a few beers or perhaps something harder, were freaked out upon realizing that the house wasn't there anymore. I'd love to hear from anyone who's seen the house - either the "original" or a ghostly version. Drawings would be greatly appreciated!